Nearly one-third of all annual giving occurs in December, but with more than 767 million people living in extreme poverty and more than 793 million undernourished people worldwide, it is important that charitable giving continues throughout the year. Individuals can help. but corporations are in a position to really make an impact. RewardExpert connected with Ren Jean Chong, Marketing Manager of Buy One Give One (B1G1), to understand more about how small actions can make big changes around the world. B1G1 is in the business of making it easy for corporations to give. For every transaction that takes place, something good happens, such as a newly planted tree. B1G1 has more than 2,000 business members funding more than 500 projects, Chong said. Even the smallest gesture can have an impact. Water for person costs a penny a day. A child’s education is less than a nickel a day to fund. A tree can be planted for $1.25, she said. “The biggest challenge lies in the nature of our industry itself,” Chong said. “In typical B2B businesses, you offer a solution to a problem that businesses are actively looking for. In B1G1’s case, we are trying to sell something that businesses don’t really need, although it’s great for them and the world,” Chong noted. Join the Membership Program. Businesses pay an annual membership fee of $220 and a one-time set-up fee of $200, which sustains B1G1 operations and allows them to contribute 100% of donations toward the designated project or charity. Select from over 500 high-impact projects that are in-line with the 17 Sustainable Development Goals (SDGs). Decide how your company will give by creating a Giving Story. For example, for every sale you make, you can provide a meal for one at-risk child. Need some inspiration? Check out these stories. It’s also easy for businesses to show their customers how they’re making a difference in the world by using B1G1’s impact tracking tools. Gratitude Certificates can be given to customers after a purchase, which is a great way to connect with your customers and let them know how truly important their business is. 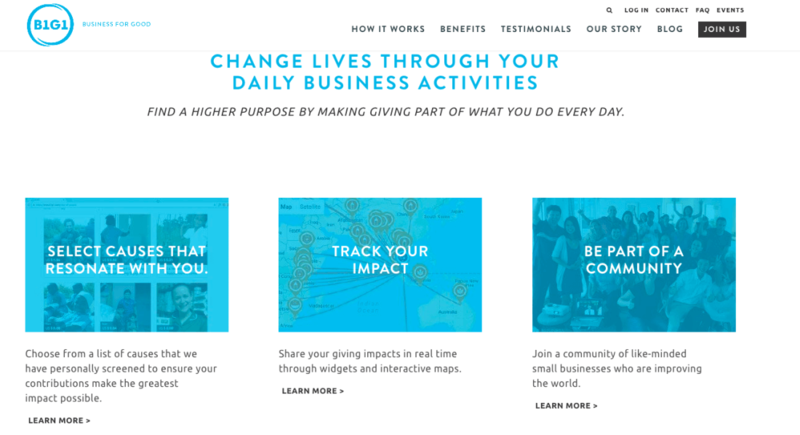 The Live Impact Map shows how positive changes are happening around the world. The non-profit works with NGO partners to ensure that 100% of the money received really goes towards creating an impact. So, if it costs $12 to give a goat to a family in need, $2,400 equals the distribution of 200 goats. “Our NGO partner signs a remittance acknowledgement to guarantee that they will utilize this $2,400 to purchase 200 goats that will be distributed to 200 families, and are responsible for sending regular updates on the progress of the goat project that we subsequently share with our members,” she said. Check out their latest annual report to see just how much of an impact B1G1 and Businesses for Good are having on the world. If you aren’t a business owner, you can still make financially sound purchases by shopping at stores and doing business with B1G1 partners. Their search portal allows users to search by industry, country or keyword. Possible businesses range from tech companies to veterinarians to accounting firms. Visit B1G1.com to learn more about the different projects and charities.